I like using watersoluble graphite. They are handy and a good medium to practice tonal values with. 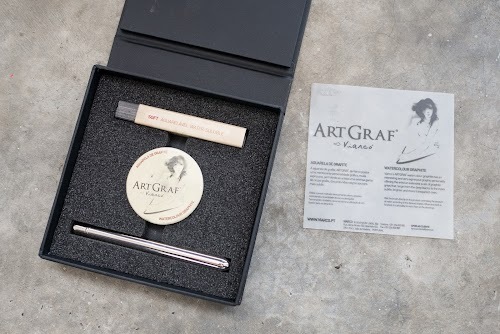 The set I'm reviewing today is the Viarco's ARTGRAF watercolour graphite set. The product is made in Portugal. 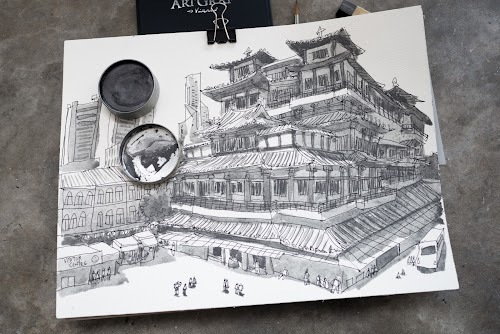 This set consist an Escoda size 4 synthetic travel brush, a graphite stick and graphite pan. They are laid out nicely in a box with cushion padding. Graphite is a very textural medium, and when you have something like watersoluble graphite, you can expect some really beautiful textures that result from the granulation. If you look at the full size scan, you'll be able to see how the graphite settles on the watercolour paper. The texture is almost a character by itself. The graphite wash above is applied with a waterbrush. 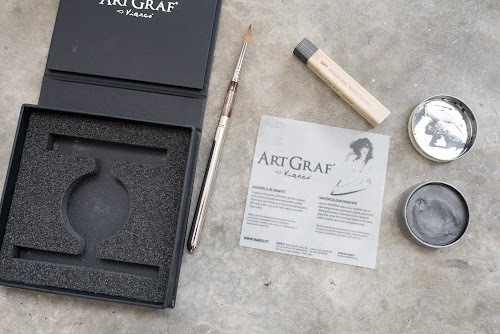 To achieve a flat wash, definitely use a normal brush, and premix the graphite evenly first. The wash here are from the graphite pan. To get truly dark blacks, you need to layer the washes a few times, or use a thick coat of graphite. The graphite stick included is much darker. The gray from the graphite is a neutral gray. I've tried using it alongside watercolours, but the gray and the colours just do not go well together. The lines are drawn with Sharpie markers and the shade is from the graphite stick. 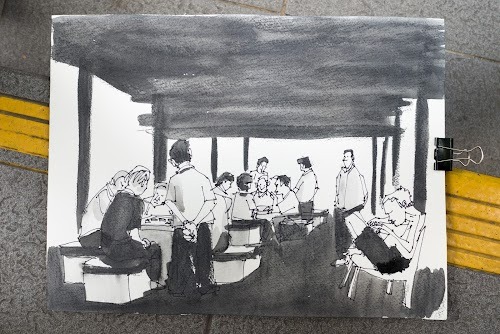 The first time I ran the waterbrush across the graphite on the paper, I was shocked by how dark the shade is. It's much darker than the graphite from the tin pan. If you apply the graphite stick to the paper and then add water, it's going to be quite dark. If you want to achieve tonal variation, I suggest premixing on a palette first for better control on the intensity. 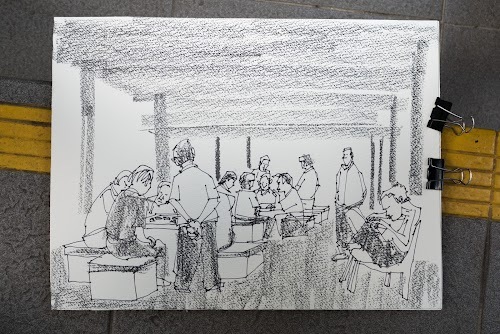 Prior the using ARTGRAF, I was using the Derwent Graphitone pencils. I prefer the ARTGRAF. The graphite from the pan is hard but dissolves more readily and can be applied quicker. It also goes back to the nice hard solid form after drying up. There's no flaky stuff to deal with. After the graphite is dried on the paper, it's more or less permanent but I would suggest using fixative to protect the surface. Without fixative, your fingers can pick up the graphite, just as you would if you rub your fingers against pencil lines on paper. The items in the set are also sold separately. And if I were to buy them separately, I would just get the graphite pan. If you already have the brush, you don't need the synthetic one that comes in the set. For beginner, which will you recommend in terms of easy to control? Go with watercolour graphite first, eg. Daniel Smith's watercolour tube. Then if you want to experiment with more textures and variation, get the ArtGraf.